Perfect with poultry, lamb, beef, grains, greens--pretty much everything! Place a large sheet pan in the oven and heat to 500°F. Scrub the sweet potatoes. Leaving the skins on, halve the potatoes crosswise, then halve them lengthwise. Lay the cut-side down and slice the potato crosswise into 2- to 3-inch wedges. 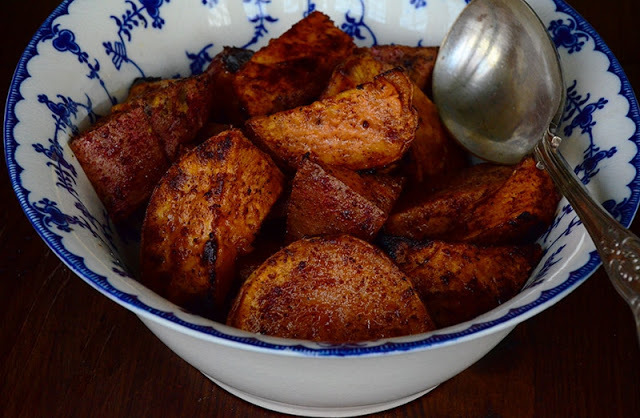 Place the potato wedges in a large bowl. In a small bowl, whisk the neutral oil, salt, sumac, cayenne, black pepper, and honey until combined. Pour over the potatoes and stir with a large spoon until the potatoes are well coated. Remove the sheet pan from the oven reduce the oven to 425°F. Line the pan with parchment. Place the potatoes on the pan, arranging them so they aren’t touching one another. Roast the potatoes for 20-30 minutes, turning the potatoes over with tongs halfway through roasting, until they are golden brown and cooked through. Take care not to overcook them.